A mass notification system that would use cell phones to alert people about emergencies was discussed by Mike Baxter, Jefferson County emergency management director, before the county commissioners Monday. The system uses QR codes that will activate a cell phone whenever it is in the county or inside the designated portion of the county being alerted. Barker was a University of Kansas professor who ran the Midwest Psychological Field Station in Oskaloosa from the late 1940s to the early 1970s. Barker and his wife, Louise, now lie buried in the town cemetery. The iconoclastic Barker saw his work as revolutionary, and by the early 1960s, establishment figures in psychology could no longer ignore his prodigious and painstaking output. Barker won hundreds of thousands of dollars in grant money and was decorated with the same prestigious awards given over the years to better-known luminaries like B.F. Skinner, Jean Piaget and Noam Chomsky. Margaret Mead visited Barker’s field station, as did Washington officials, foundation presidents, and scholars from universities as far afield as Norway and Australia. But the shining new path Barker had illuminated for psychology faded suddenly into oblivion, the victim of forces Barker felt powerless to control. In “The Outsider,” journalist and author Ariel Sabar tells a cinematic story of Barker’s improbable rise and fall. The page-turning narrative takes readers on a journey into the life and times of one of psychology’s most original thinkers, raising fascinating questions about what separates the Darwins and Freuds of science from the sometimes just-as-brilliant also-rans. Sabar is the author of “My Father’s Paradise: A Son’s Search for his Family’s Past,” which won the National Book Critics Circle Award for Autobiography, and “Heart of the City: Nine Stories of Love and Serendipity on the Streets of New York.” He is a contributor to Smithsonian Magazine whose writing has also appeared in Harper’s, The New York Times, The Boston Globe, and The Washington Post. A graduate of Brown University and an award-winning former staff writer for The Providence Journal, The Baltimore Sun, and Christian Science Monitor, Sabar has taught creative writing at The George Washington University and lectured on the crafts of journalism and memoir at Brown, Johns Hopkins, and Georgetown. In a note to the Independent, the author said, “I had the pleasure of visiting Oskaloosa back in December 2010 for a story about Barker I wrote for the May 2013 issue of Harper’s Magazine. This e-book is a significant expansion of that piece that focuses as much on Barker’s remarkable life in Oskaloosa as it does his work. Terry shows some flower arrangements on display in the floral shop. Much more will be ready for the upcoming Valentine’s Day rush. Dave sits at an antique poker table. In an earlier era, only cards and chips were allowed on the table. This style poker table has a disk at each corner for one to place other items, such as drinks. This was a common style in the late 1880s, though few exist today. This one came from a pub in Three Rivers, Minn. This weekend marks the grand opening of a new enlarged facility for Colonial Acres Floral and Antiques on the south side of Oskaloosa. Dave and Terry Taylor have constructed a new building to house their floral and antique shops, plus it has a large open area for meetings. The shop is located behind their home across from the law enforcement center at 8998 Highway US-59. The open house will run from 10 a.m. to 4 p.m. Saturday and noon to 4 p.m. Sunday. Colonial Acres Floral has been open for a year, however, the new building allowed for expansion into antiques and the addition of a meeting space. Dave said the antiques will be mostly glass and some furniture to start with. They plan to adjust their selection by what people show an interest in as they grow. The floral shop is gearing up for Valentine’s Day with a large selection of roses coming in. Terry said they try to have a wide selection of items in a variety of price ranges so even the young people can afford flowers to take to school. Floral arrangements are handcrafted on site by their lead designer, Delpha Forshee. Forshee has over 35 years experience in the industry and takes pride in crafting each piece. The east end of the building is a large open area for meetings and small events. Dave said it should easily hold 60 people or more. It is heated and air conditioned for year-round use, and includes restrooms. There are modern folding chairs and large folding tables, plus a long counter for setting up food or displays. For presentations, he has mounted a projector and wall screen for PowerPoint displays. Dave was born and raised in White Cloud, in the northeast corner of the state. He was a driver for UPS in 1977 when he got familiar with the Oskaloosa area. He liked the town, and bought a farm and moved here. Terry came from an Army family. They were originally from Emporia, but she has moved a lot being military. In Oskaloosa she originally worked for the Jefferson County Abstract Company, then she bought it. She sold it in 2000. In 2008 she started Assured Title, which they run out of their home. They have let their 15-year-old grandson use part of their farmland to get started in the cattle business. He also raises corn on part of the land. The corn is the peaches and cream variety, which is a bi-color corn. He has sold it at a stand in front of their home and it has been popular and helped him earn expense money. For more information about Colonial Acres, their web site is colonialacres.info and their phone is 785-863-3455. A structure fire late Monday night destroyed two businesses on the Oskaloosa square. The fire is believed to have started in the basement of Rose’s Cafe at around 11:30 Monday night. Several fire departments from around the county were on hand to help extinguish the flames from Rose’s. The fire departments worked throughout the night to make sure the flames were extinguished. The fire spread into the southern half of the building that housed Pia Friend Realty and left a good portion of the building charred. Local fire departments did, however, manage to contain the fire to the one building and did not allow it to spread north into the neighboring bank. The fire left all of the cafe in a charred heap in the basement after the fire caused the interior floor to collapse. The structure remained intact and nobody was injured in the fire, according to city officials. The investigation into the fire was still ongoing to determine the exact cause. Monte Moore stands with his son, Matthew, in the Meriden gas station they now call their own. What was originally ZZzzz’s Convenience Store, is now the Meriden Tiger Den owned by the Moore family who live between Winchester and McLouth. The station will be receiving a facelift once spring rolls around as well as other small changes that the Moore family hopes will make their new business thrive. The Meriden gas station, ZZzzz’s Convenience Store, is already undergoing changes including a new name and new owners. Starting January 3, Monte Moore and family reopened the station under the name, Meriden Tiger Den. The Moore family is eager to see what their new family business has in store. Changes for the gas station and convenience store will be visible come this spring, Monte says. They include an overall expansion, new bathrooms, a small sitting area, a refresh of inventory, and a pay-at-the-pump option when it comes to filling the gas tank. Monte says that serving hot, prepared food will also give those passing through Meriden another option for food. Monte previously worked at an accounting firm in Kansas City for 17 years and worked with UPS for 11 years before that. After working with big companies for so long, he said he was ready to be his own boss. After looking at different convenience stores and stations, he decided that the Meriden station would be a perfect place to start fresh. Monte has a business and accounting degree which he hopes will help him ease into the transition of becoming a business owner. “Anything that’s a new challenge is fun and exciting,” he said. Previous owners, Jim and Debbie Zwygart, owned the gas station for 28 years. Monte says they are very supportive and he appreciates their help whether it be through training or just stopping by to check on how things are going. Monte says that the best part of owning the station is having the opportunity to meet new people while making connections with the locals who stop in often, whether it be to get gas or to stop in for morning coffee. He hopes that the station will do well financially as he is helping his children pay for college tuition. He also stressed that this will be a family-run business and he is thankful that he has a lot of support from his wife and kids. The Moore family lives in a rural area between Winchester and McLouth. Monte’s wife, Shawna, is employed at Keystone Learning Services out of Ozawkie. Their oldest daughter, Amanda Aragon, 26, lives in Seattle, Wash., with her husband, Irving, and daughter, Ava, 1. Their other two children are Matthew, 23, and Amy, 20. All of the kids graduated from Jefferson County North High School. Betty Jane Wilson, Valley Falls Historical Society president, is seated in an upstairs room of the museum. 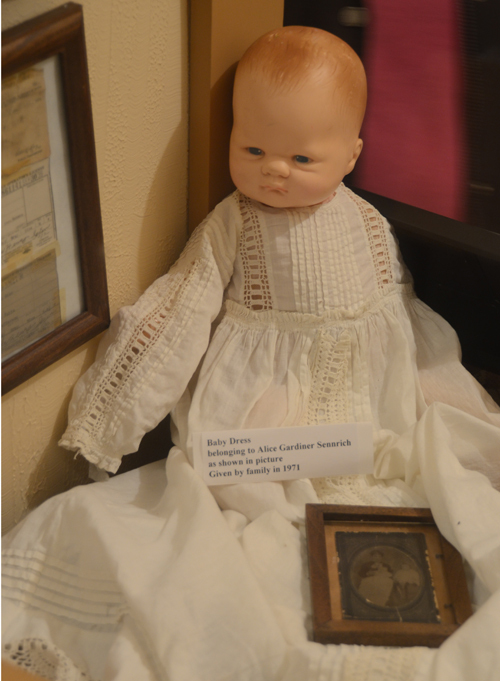 Here, she sits on a piece of antique furniture and in the mirror behind her, there is a display of just some of the antiques the museum has to offer, including a crib, child’s nightgown, artwork, and different furniture pieces. The Valley Falls Historical Society Museum has been fairly quiet these past winter months, but president Betty Jane Wilson hopes that as the weather warms up, the museum will once again be full of people with a hankering for history. The museum recently had a late-night visitor who was the daughter-in-law of a former Valley Falls barber. Whether by luck or happenstance, his old barber tools were just around the corner in a display. Another time, a woman by the name of Mildren Gilleece Olden had mentioned wanting to visit the museum with interest in looking at a bed. Not particularly sure what she was looking for, Betty Jane showed her around. Shortly into the search, Olden showed a wide-eyed gaze at a baby crib displayed upstairs. 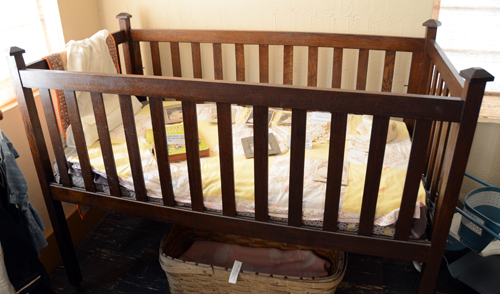 Robert Nesbitt, Olden’s uncle, built the crib for his baby niece in 1918. Betty Jane says she enjoys learning more about the history of the items in the museum and has Frank Shrimplin, Valley Falls, to thank for all he has taught her when it comes to genealogy and all things history. For example, when nearby schools come for a field trip, the children are usually most interested in a set of school desks that were used at a former country one-room schoolhouse. They are fascinated when told that as students get older, they move up to bigger-sized desks. The kids, of course, have to try out each one, she said. The desks came from a country school that Betty Jane attended as well as her father, uncle, and aunt. With such a generation gap, she said it can be a challenge knowing what kids these days will be interested in. One young boy came in and seemed very uninterested in many of the displays, but was so intrigued by a modern oscillating fan that was cooling down the room. Betty Jane was also surprised to know that many young kids today have never seen a dial phone with the exception of in movies. On the other spectrum, she remembers a young girl several years ago who came in for a visit with her school. The girl had politely asked if she could look at a photo album sitting on a side table. She picked up the book as if it was a precious item and gingerly turned each page to look at the pictures inside. She and another young boy sat together looking through the entire photo album while giggling at all the funny outfits the people were wearing. This priceless moment, Wilson says, is what makes all of her hard work worthwhile. For many adults who come in, their main goal is to find ancestors’ high school pictures in the old Valley Falls High School composites displayed upstairs. Another display that often strikes them is pictures of the old Rio Theater that ran in downtown Valley Falls. Betty Jane says that many recall going to watch a film there or even selling tickets and popcorn as an after-school job. She has also been given a heads-up that there are original theater seats in the apartment above what is now Flamingo Too, and hopes to have help getting them into the museum soon. The newest addition to the museum’s collection is a salt and pepper shaker display in a lit cabinet. This collection was given by Nora Heugel’s family. Nora collected the salt and pepper shakers and was the mother of Edith Harden, who donated many hours to the museum. Aside from the many historic antiques displayed at the museum, one in particular is once again thriving. The Santa Fe Depot fern that sits near a window in the lobby of the museum is now prospering again after getting top heavy and falling over. Betty Jane, who cares for the landmark fern, had much help getting it restored and is happy to have it back in keen condition. The fern dates back to 1915 when it was purchased by Hiram Miller, who worked at a grocery store in Valley Falls when he was a teenager. After being re-potted several times and being passed from owner to owner, it now belongs to the historical society and is doing well. With Kansas Day coming just around the corner, those passing by can enjoy the festive window display coming soon to celebrate the holiday. Members of the Valley Falls Historical Society are still anxiously awaiting news on when the Historic Shrine Church will be moved next door. Until then, bricks will be collected. As a fundraiser, the historical society has been selling engraved bricks for $50 and has sold over 400 thus far. Members of the society hope that bringing the church downtown will add greatly to the rich history of the museum which tells the story of the people, places, and events that have made Valley Falls the town it is. This baby bed was donated in 1995, but it was unknown where it came from. After taking a visit to the museum, Mildred Gilleece Olden was delighted to see the crib as she recognized it was one her uncle, Robert Nesbitt, had made for her in 1918. Betty Jane Wilson donated this very personal piece to the museum. 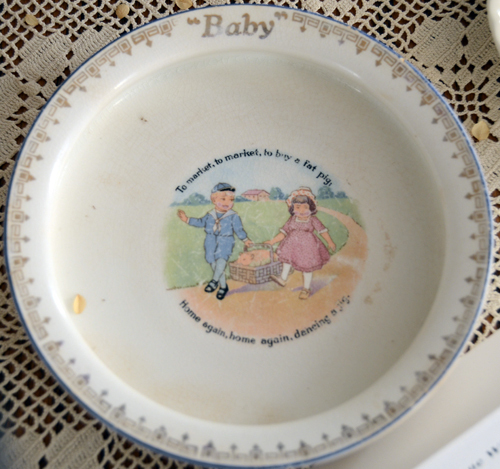 It was her very own childhood bowl and dates back to 1920. 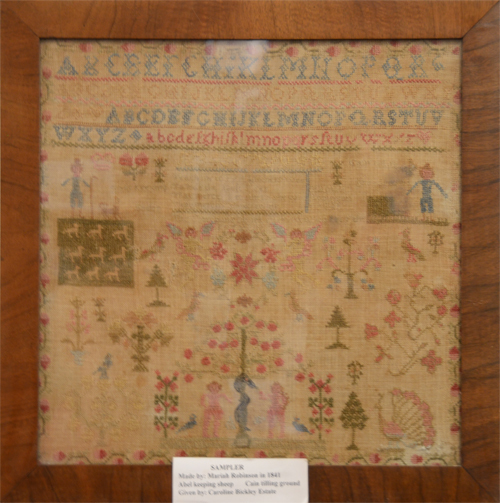 This cross-stitch piece of work is the oldest item in the museum. It dates back to 1841, which makes it older than the state of Kansas. It was made by Mariah Robinson and was donated by the Caroline Bickley Estate. he doll pictured is wearing a baby dress that belonged to Alice Gardiner Sennrich. It was donated to the museum by her family in 1971. Betty Jane Wilson, society president, pointed out how good of condition the white dress with no yellowing was in. Santa Ana winds that fanned a campfire into a wildfire that destroyed five homes and threatened foothill neighborhoods east of Los Angeles relented Thursday afternoon, halting the blaze in its tracks, while police held three men in custody after they allegedly started the blaze. The fire swept through 1,700 acres of brush in the San Gabriel Mountains early in the day but by nightfall it was no longer advancing and was 30 percent contained. “The weather cooperated quite a bit today. We didn’t get the wind … that we thought,” Los Angeles County fire Deputy Chief John Tripp said. Some 3,700 people from Glendora and Azusa evacuated at the height of the fire, county emergency officials said. Glendora residents were allowed to return home Thursday evening, but homes in Azusa remained under evacuation orders. It wasn’t clear how many remained evacuated. However, fire engines would remain to guard the area overnight, he added. The National Weather Service said a red-flag warning of extreme fire danger would remain in effect into Friday evening because of low humidity and the chance of winds gusting to 30 mph in the foothills and canyons. The wildfire, which erupted early Thursday, damaged 17 homes, garages, barns and other buildings, Tripp said. At least 10 renters were left homeless when the fire destroyed rental units on the historic grounds of a retreat that once was the summer estate of the Singer sewing machine family. Statues of Jesus and Mary stood unharmed near the blackened ruins. However, the main, 1920s mansion was spared. “It’s really a miracle that our chapel, our main house is safe,” owner Jeania Parayno said. Alex Larsen, 50, rented a room at the estate. The musician had lived there for about four years. “All my possessions are toast, burned toast,” he told the Los Angeles Times. Two firefighters had minor injuries and a woman trying to fight the blaze near her home suffered a minor burn, Tripp said. Three men in their 20s, including a homeless man, were arrested on suspicion of recklessly starting the blaze by tossing paper into a campfire in the Angeles National Forest, just north of Glendora. Those arrested were Clifford E. Henry Jr., 22, of Glendora; Jonathan C. Jarrell, 23, of Irwindale; and Steven R. Aguirre, 21, a homeless man from Los Angeles, MyFoxLA.com reported, citing Glendora police. They were each being held in lieu of $20,000 bond Thursday evening. Glendora Chief Tim Staab said the men were trying to keep warm and the wildfire appears to have been an accident. “One was very remorseful for starting this fire,” he said. The men could face either state or federal charges, depending on whether the campfire was on federal forest land, he added. The Angeles National Forest was under “very high” fire danger restrictions, which bar campfires anywhere except in fire rings in designated campgrounds. There are no designated campgrounds in the area where the fire began, U.S. Forest Service spokeswoman L’Tanga Watson said. The mountains rise thousands of feet above dense subdivisions crammed up against the scenic foothills. Large, expensive homes stand atop brush-choked canyons that offer sweeping views of the suburbs east of Los Angeles. Whipped by Santa Ana winds, the fire quickly spread into neighborhoods where residents were awakened before dawn and ordered to leave. Jennifer Riedel in Azusa was getting her children, ages 5 and 7, ready to evacuate. However, other homeowners choses to stay, despite firefighters’ orders to get out. Some wore masks against the ash and smoke as they wet down their properties with garden hoses. The last catastrophic fire in the San Gabriel Mountains broke out in 2009 and burned for months, blackening 250 square miles, killing two firefighters and destroying more than 200 structures, including 89 homes. The flames could have abundant fuel to consume. Vegetation above Glendora had not burned since a 1968 fire that was followed by disastrous flooding in 1969. Many homes are nestled in rugged canyons and ridges that made access difficult. Glendora police went door to door ordering residents of the upscale city of 50,000 to leave. Citrus College and several other schools canceled classes. More than 700 firefighters were on the scene, along with 70 engines and a fleet of helicopters and air tankers dropping water and retardant. The smoke was visible from space in satellite photos. The South Coast Air Quality Management District issued a smoke advisory and urged residents to avoid unnecessary outdoor activities in directly affected areas. About 70 miles to the northwest, another fire burned one acre of tinder-dry chaparral near Pyramid Lake before it was contained. Authorities say the blaze began in a mobile home. No injuries were reported. California is in a historically dry period, and winter has offered no relief. Large parts of Southern California have been buffeted all week by the region’s notorious Santa Ana winds, which have contributed to some of the region’s worst wildfires. The winds form as the cold inland air flows toward Southern California, then speeds up and warms as it descends in a rush toward the coast. Some of the most extreme gusts reported by the weather service topped 70 mph. The Santa Anas typically begin in the fall and last through winter into spring. The winds also raise temperatures to summerlike levels. Many areas have enjoyed temperatures well into the 80s. State fire inspector Lamar Shoemaker and a few firefighters search through the smoldering embers of a house fire that took a life early Saturday, Dec. 30. Firefighters were called to the home of Bobby Metzger, 73, at about 6:15 a.m. Metzger’s body was recovered from the house and sent to a morgue in Kansas City for positive identification and an autopsy. Fire departments responding were Fairview, Ozawkie, Oskaloosa, and Kentucky. The home was located at 8335 Hamilton Road, rural Ozawkie, just south of the Lakewood Hills Subdivision. A memorial visitation gathering for Metzger will be held from 1 to 3 p.m. Jan. 11 at the Barnett Family Funeral Home, Oskaloosa. House fires hit backyard neighbors the night of Dec. 31 and Monday morning near 18th and Main streets. No one was home at the time of either fire and there were no injuries. The first fire began on the porch at 1749 Main St. about 10 p.m. Dec. 31, at a home rented by Heather Poage and owned by Carl Guilfoyle. Poage said her neighbors reported hearing fireworks that evening. “I’m wondering if it was a misguided bottle rocket,” she said. Love, who said an investigation was being made into the fireworks reports, said the fire reached into the attic and above the garage ceiling. Personal property damage, Poage said, was contained to some items in the garage that she had planned to sell in a yard sale. Damage was more extensive Monday morning at a fire at 1750 Main Street Terr., which brought firefighters out in temperatures reaching toward -20F. Renter Chad Flynn was not home about 9 a.m. when a neighbor reported a fire at his house, owned by Bill Smith. Fire Chief DuWayne Tewes said that blaze was in the attic and appears to have been electrical in origin. Tewes said fire crews needed to pull the ceilings to reach the blaze and smoldering insulation. Poage, whose fire-displaced family includes twin sons Hunter and Bailey, 16, and daughter Layla, 5, said she received many text messages Monday morning telling her that her house was on fire again. “I was on my way over there,” she said, “but I passed (Assistant Police Chief) Bob Butters, who told me it wasn’t my house,” she said. Poage and daughter Layla, 5, were staying at the home of music teachers Mike and Julie Packard after the fire. Son Bailey was out of town performing with the All State Invitational Marching Band at the Orange Bowl in Florida when the home burned and son Hunter was out of town visiting a friend. 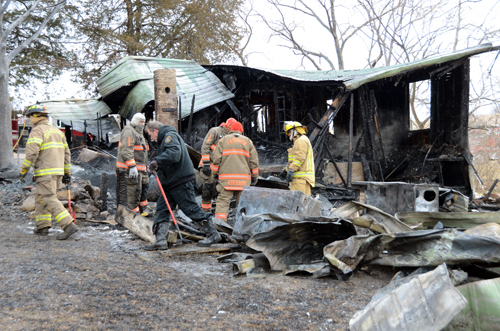 Poage and her daughter were visiting friends New Year’s Eve when she received a call about her home being on fire. Poage said the support for her and her family began as she was walking toward her car after the fire was extinguished. That was when the Red Cross phoned, she said, making sure she had a place to stay. She did, as Julie Packard had already offered her home to the family. “She’s a good friend and a good mom, so you just do what you have to do,” Packard said. Poage said Monday she had found another rental home in town for her family. “Everything’s just fine,” she said, listing the many people who offered their help in a number of ways. © 2014 Osawatomie Graphic. All rights reserved. This material may not be published, broadcast, rewritten or redistributed.